Solar PV & Voltage Optimisation? 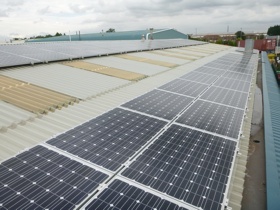 Solar PV systems generate energy and export that energy onto the national grid through inverters. The inverter raises the output, (generated), voltage by approximately 2-5 Volts above the grid voltage. This allows the generated energy to travel up stream from that of the incoming grid voltage. For electrical dependant loads this can mean they consume more power due to the increased voltage being above and beyond what they need to function correctly and the extra power ends up being increased losses, often generating heat and often shortening the electrical life of expensive appliances. All Electrical Equipment in Europe since c1992 now carries the CE mark. This means that all electrical appliances must operate on a voltage range between 207V and 253V. The optimum voltage is 220V so any voltage higher than this is considered to be waste and results in un-necessarily higher electricity bills. C Gascoigne Ltd. install voltage optimisation units that work specifically with Solar PV Installations and will optimise the voltage to the property ensuring electrical equipment is not subjected to the higher voltages and as a result reduces the total load drawn which means more of what is being generated by the Solar PV system can be exported.